Made of rigid plastic material that is resistant to warping, our rigid Poly is perfect for ready-to-frame applications, customized artist statements, custom printed and/or textured surfaces and a beautiful compliment to a top-stack mount. Whether you choose to use rigid poly, foamcore, gatorboard, matboard or wood substrates, your photos will be displayed on a durable, lightweight surface–perfect for bin print displays and smaller dimension artist offerings. 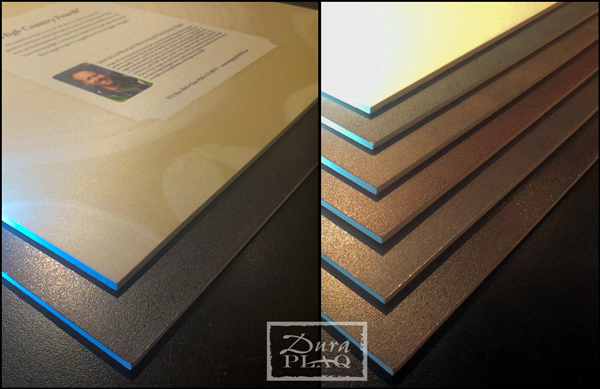 DuraPlaq proudly customizes the mountable surface, the backside and desired finish for your mounted artwork display. Velvet finish comes standard with an endless array of colors, textures and patterns to choose from. Contact our design team today to learn more about customized rigid Poly mounting for your display needs!